The dumbbell lateral raise targets your shoulders. 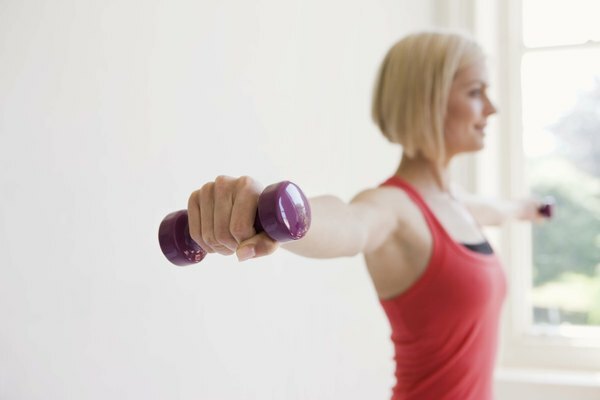 Working out with dumbbells is an effective way to build strength and increase muscle tone. 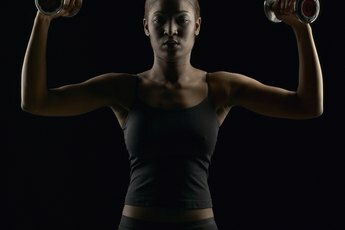 Although dumbbells may seem more intimidating than working out on machines, women of all training levels can safely incorporate dumbbell conditioning into their regimen. Training with dumbbells is more ideal than using machines because they force more of your surrounding and stabilizing muscles to become involved. To condition with dumbbells, first put together a dumbbell workout based on your goals and then find the weight of dumbbells that are right for you. Schedule your dumbbell workouts two days per week and with two days of rest in between each training session. Your muscles should get about 48 hours of rest to recover. Pick one dumbbell exercise for each of your major muscle groups. Your major muscle groups include the chest, back, shoulders, biceps, triceps, glutes, quadriceps, hamstrings and calves. For your chest, choose from the dumbbell chest press or dumbbell chest fly. For your back, complete a dumbbell row exercise. Develop your shoulders with a shoulder press or lateral raise. Focus on your biceps with biceps curls and on your triceps with kickbacks. Dumbbell squats and dumbbell lunges target your glutes, quadriceps and calves. Focus on your hamstrings with dumbbell deadlifts. Complete each exercise with two sets of 10 to 12 repetitions and then rest one to two minutes before moving onto the next set. Choose an appropriate weight of dumbbell for each exercise. Start with an extremely light weight until you master the technique for the exercise. Once you feel comfortable, use a weight that will challenge you during each set. If you’re able to perform 12 repetitions with ease, bump up the weight of dumbbell you’re using. Hold the dumbbells with your wrists in a neutral position. Your wrists should be a straight. They shouldn’t be curled or extended as you hold the dumbbells because this places stress on your wrists. Complete the larger, multi-joint dumbbell exercises at the beginning of the workout and then move onto isolation, single-joint exercises. For example, you’ll do squats, lunges, chest presses and dumbbell rows before moving on to lateral raises, biceps curls, kickbacks and deadlifts. When you are working with dumbbells, a risk exists that you'll lose control of the weights. Depending on the exercise, the weights could fall on your feet or head. To reduce the risk of injury from dropping the weights, recruit a friend to act as a spotter.